I was cleaning out the garage this weekend and ran into this little guy. I’ll admit I was a bit startled at first to see a two inch bug with big “eyes” moving across the floor. Once I picked it up though I was amazed how interesting it looked and figured I better find out if it was a beneficial or if it deserved squashing. The beetle Alaus oculatus is commonly referred to as the Big Eyed Click Beetle or Eastern Eyed Click Beetle. 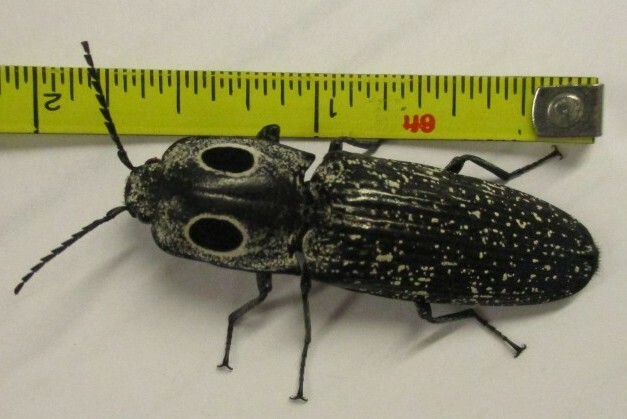 The click beetles are the acrobats of the insect world in that if they are turned over on their back they are able to flip themselves in the air and land on their feet. This action creates a clicking noise which helps with their natural defense. The A. oculatus spends most of its life (2-5 years) in the larval form as a “wireworm”. Most wireworms are pests as they feed on vegetation but the A. oculatus is a ferocious meat eater and dines on the larvae of many undesirable insects like wood boring beetles and flies. Posted in Beneficial Insects, entomology. This entry was tagged Beetles, Beneficial Insects, entomology. Bookmark the permalink.